52 Days til Start Date…Wired’s on Facebook! 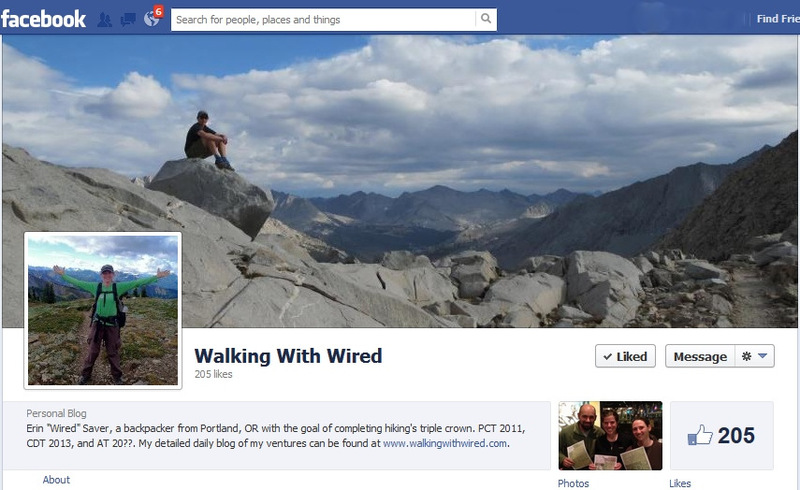 Click here to follow Walking With Wired on Facebook. Just this week, I started a Walking With Wired Facebook Page. I’m excited about it for many reasons. I primarily created this blog to make it easier for people to stay updated on my happenings and share what I’ve found inspirational. People are busy these days and I know that not everyone can read EVERY daily post I’ll be writing on this blog while I’m on the trail for five months. My plan is to use the page to keep people in the loop while also posting bonus material I wouldn’t normally take a whole blog post to write about. For example, this week I posted a photo from a dinner I had with fellow future CDT hiker, Drop-N-Roll and CDT mapmaker, Johnathan Ley. While on the trail, I plan to post sporadically with random thoughts, photos, or happenings at the moment. I think it will be fun for people who are going about their regular day to see an update on their Facebook Feed from Wired somewhere along the Continental Divide. For those who aren’t able to read my whole journal, I will update my status every week or so to let people know how the hike has been going. In addition to keeping people informed, the Facebook page also solves two problems I’ve had since creating the blog. I regularly get emails from people asking questions or giving thanks/support. Getting messages through Facebook will be a great way for me to put a face to the name of those I hear from often. Also, I have gotten many “friend” requests for my personal Facebook that I use exclusively for friends and family. The Facebook page allows me to interact with these people without “friending” strangers. I know that there are some Facebook haters out there and that is a whole other discussion. I will still be posting my detailed daily journal on this blog, so nothing will ever change that. To follow the Walking With Wired page on Facebook, just click on this link to the page and then select “LIKE” on the right hand side below the banner photo. You will know you’ve done it correctly once there is a check mark next to “Liked” as in the example above. Once you have liked the page, the status updates will just come up on your feed like your other “friends.” Feel free to share this page with others who might “LIKE” it! You can help me spread the word by “sharing” this page on your timeline. All you need to do is click on the small drop down arrow next to “message” as you can see in the example above. The drop down menu will give you the option to share the page with whomever you’d like. Thanks for spreading the word!